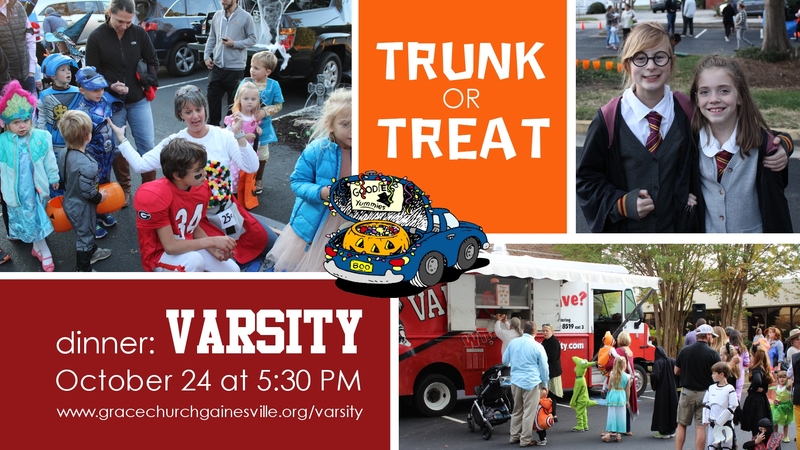 Trunk or Treat returns to Grace on Wednesday, October 24 at 5:30 PM. Decorate your car and pass out candy, or just enjoy dinner and seeing the children in their costumes! The Varsity food truck will be here to cater dinner. A meal for adults and youth (grades 6-12) costs $12 for two entrees and a side or $10 for one entree and a side. Children’s (5th grade and younger) meals are $5 for one entree and a side. “What’ll Ya Have?” Make a meal reservation online no later than noon on Monday, October 22. Contact Cheryl Kelley ASAP to reserve a parking spot if you’d like to decorate your car. No reservation necessary to just attend Trunk or Treat. Costumes are encouraged. All are welcome, bring your friends and neighbors! The mission of The Community of Hope International is “Creating communities, steeped in Benedictine Spirituality, to serve others through compassionate listening”. Our ministries, whether inside or outside the church doors, are discerned by each chaplain personally, as St. Benedict reminds all faithful people to “listen with the ear of your heart.” The CoHI chapter at Grace Church provides pastoral care to Gainesville in a variety of ways, both inside and outside the walls of our church. Chaplains in The Community of Hope (CoHI) are accountable to each other and pray, study, and worship together during monthly Circle of Care meetings. This community life invites further study of The Rule of St. Benedict and opportunities for debriefing, self-care, and growth. Prior to being commissioned, participants enter into a discernment period which includes a 14 week training time of prayer, community building, and pastoral and Benedictine study through expert presenters and study modules. This Sunday, October 21, at the 10:45 AM service, our community will be commissioning 8 new lay chaplains while our existing chaplains recommit for another year. Please join us in prayers of thanksgiving for the commitment of our chaplains and the myriad opportunities to serve and share God’s love to His people in need. Thursday, October 25 is the deadline to sign up for SAGES lunch and team trivia on Thursday, November 1 from 11:30 AM – 3:30 PM. We will provide sandwiches and drinks and are asking, if possible, that folks bring either a simple side dish or dessert to share. Sign up online, at the information station, or call the parish office at 770-536-0126. Also, if you need a ride please let us know when you register so we can make those arrangements. See you there!! For youth and adults currently in Sunday classes, please let us know if you want to be confirmed when the bishop visits on November 4. The deadline for necessary paperwork is October 22, so please contact us soon.